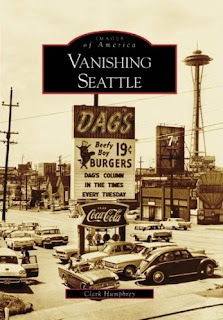 Clark Humphrey‘s new non-fiction book Vanishing Seattle (Arcadia Publishing) will be released Monday. The official release party is at Epilogue Books Tuesday, Dec. 19, 6:30 – 8 p.m. I saw a proof of the book this fall, and it’s a great combo of rare photos and Clark’s wry and incisive commentary. I’ve only lived in Seattle for 22 years, but it is shocking to realize how many of the charming places that played a key roles in the city in the 70s, 80s, and 90s are gone forever (most of them replaced by Euro-style condos with 500-square-foot studio units selling for $500,000). Clark, editor of the Belltown Messenger and former staff writer for The Stranger, is a leading authority on popular culture of the Pacific Northwest. Vanishing Seattle should be available at all the major Seattle bookshops next week; you can also order it on Amazon. Thanks for the recommend. It doesn’t seem all that long ago that these things were around …alive.